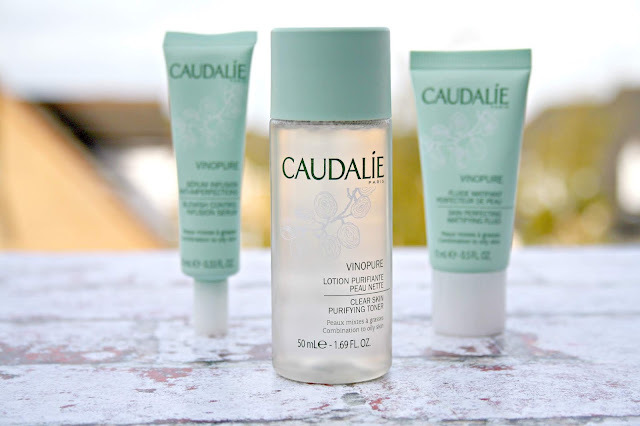 Whether you want products for hydration, anti-pollution, radiance-boosting or just to cleanse, tone and moisturise then Caudalie have a whole catalogue of products to choose from. 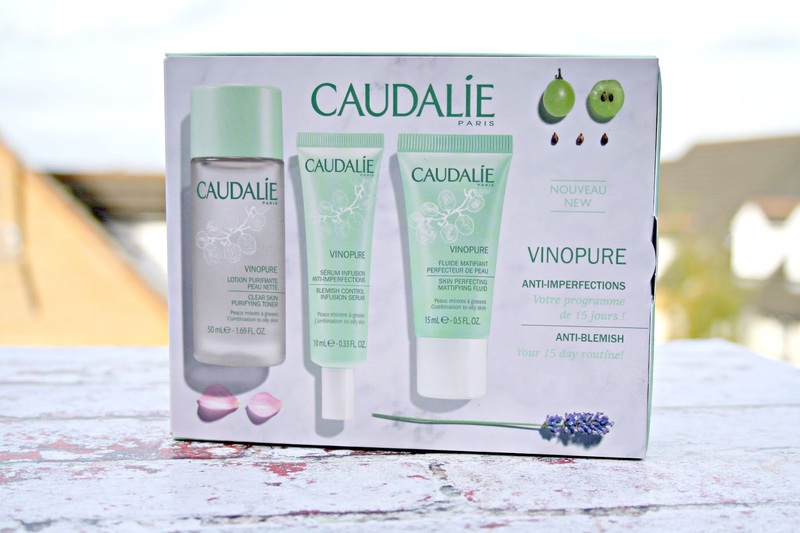 New to the range comes Vinopure, described as being a natural, simple and effective solution for combination/oily skin and it helps to reduce blemishes, shine, refine pores and reveal a new glowing complexion. 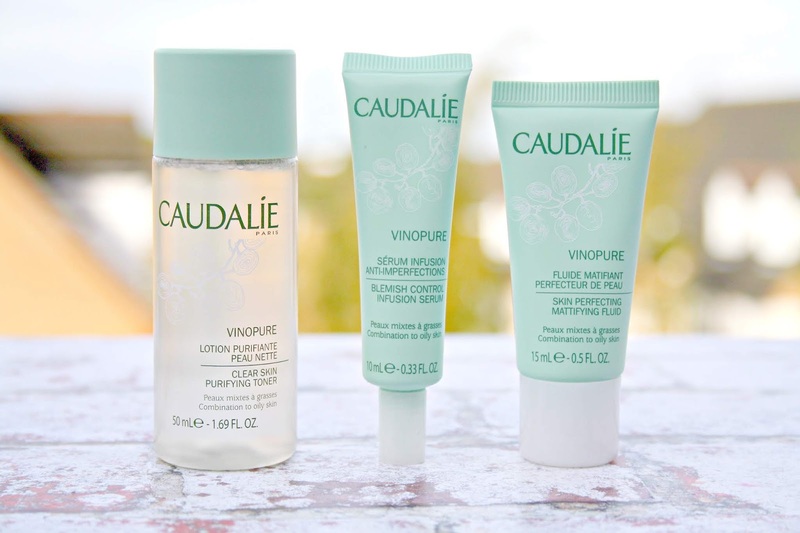 Over the past few weeks, I have been using the Vinopure 3-Step Routine using this 15 Day Clear Skin starter kit and it has been such a great way of getting to know a brand new collection. Purifying Toner (50ml) - Described as being an essential clarifier for combination skin it is my favourite of the three products so far. I love that it is weightless on the skin and is instantly refreshing but more importantly for me, it doesn't sting or leave my skin feeling dry and taut after using. Infused with a blend of Salicylic Acid, Grape Polyphenols and organic essential oils work to draw out impurities from deep within pores. What I have noticed the most since using this toner twice a day is the difference in the dryness of my skin. I have combination/oily skin and as well as often having the mid-afternoon shine, I have really dry cheeks and do everything I can to ensure they are as hydrated as they possibly can be. Using this toner has changed how dry my cheeks feel to the touch. This toner can be used twice a day, after cleansing and you simply use a cotton pad and apply to the face, neck and décolleté. Blemish Control Infusion Serum (10ml) - Described as being a concentrated purifying serum primarily designed for targeted treatment of blemishes. For me, a serum is always part of my skincare routine and has been since I had my skin scanned and it was pointed out to me that I had patches of dehydration. This Serum again natural Salicylic Acid, Grape-Seed Polyphenols, Rose Water and organic essential oils all of which come together and work to visibly diminish the look of blemishes, tighten pores and refine the skin’s texture. Again, this serum has a gel like consistency and on the skin, it is really lightweight and absorbs really quickly and is really refreshing. Suitable for sensitive skin, the formula boasts antiseptic benefits to soothe any irritation and it can also be used as a targeted spot treatment. To use, you apply morning and evening to the face, neck and décolleté and allow it to absorb before applying your cream. Skin Perfecting Mattifying Fluid (15ml) - This is the final product of this trio and it is described as being a rich and velvety moisturiser which is ideal for oily and blemish-prone skin. This fluid is enriched with organic rosewater, grape polyphenols and organic essential oils all of which come together to help absorb excess sebum, reduce imperfections and refines the skin texture, to leave the complexion clear and fresh. I love how nourishing this is, it is the one product of the three that I was unsure about when I started to use them, but having stuck with it and continued to use it as part of the 3-step skincare routine, what I love is how mattifying it is for my skin. Again, having a mid-afternoon shine on the face can be soul destroying when you are in the middle of a working day and don't have time to grab your blotting paper or your powder to touch up. Using a product like this in my skincare has made an improvement, I might be the only one to notice, but to me that is what is most important. 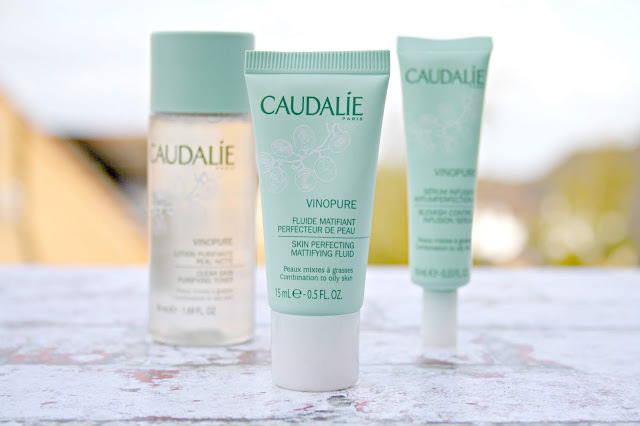 Like the rest of the products within this Starter Kit, the mattifying fluid is lightweight, it doesn't feel as though my skin cannot breathe and I love how refreshed my skin feels. If you are looking to shake up your skincare routine and want something new to try, have blemishes, sometimes breakouts, combination/oily skin, blemishes and clogged pores, then I cannot recommend trying this enough. I love that this starter kit is just £12.50 and if you are quick, LookFantastic have an offer to save 20% (here) off which makes it just £10 by using the code 20Skin but you'll have to be quick! What a fab kit at a great price too!! 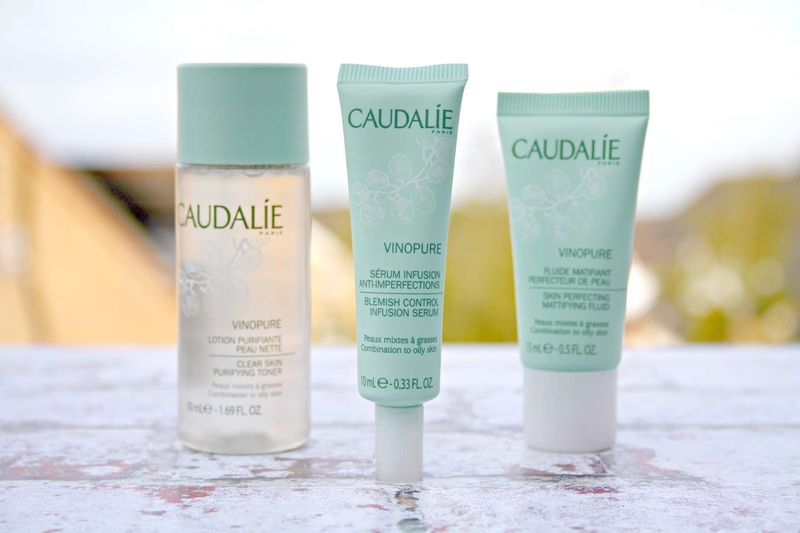 I really can't praise Caudalie highly enough. Their skincare really is wonderful. This is a great little set to introduce someone to the brand. 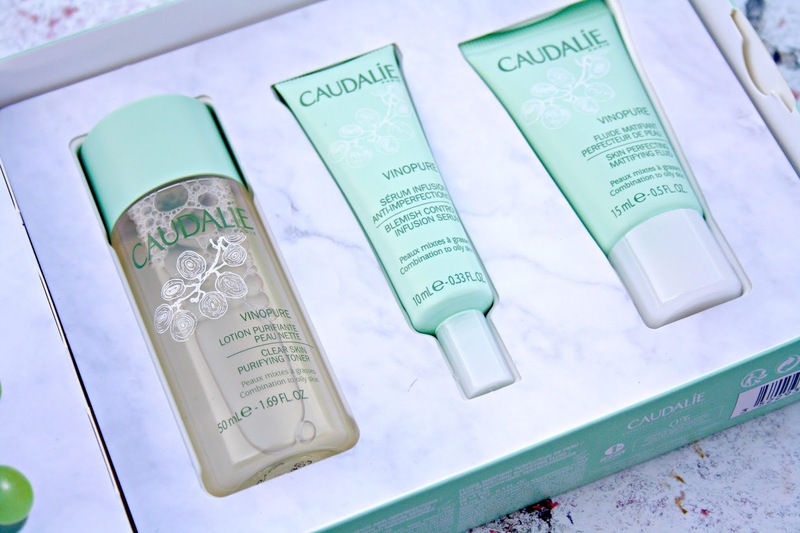 This set is such a great idea, I love starter kits, they let you see how you get on before committing to the full size and Caudalie always do everything SO well too. I need to try more from Caudalie - I loved their skincare before so I need to get myself some more - they look fab! Such a great value set of products, I love the sound of this. That's excellent value for Caudelie. They have some fab stuff for drier, mature skins too.